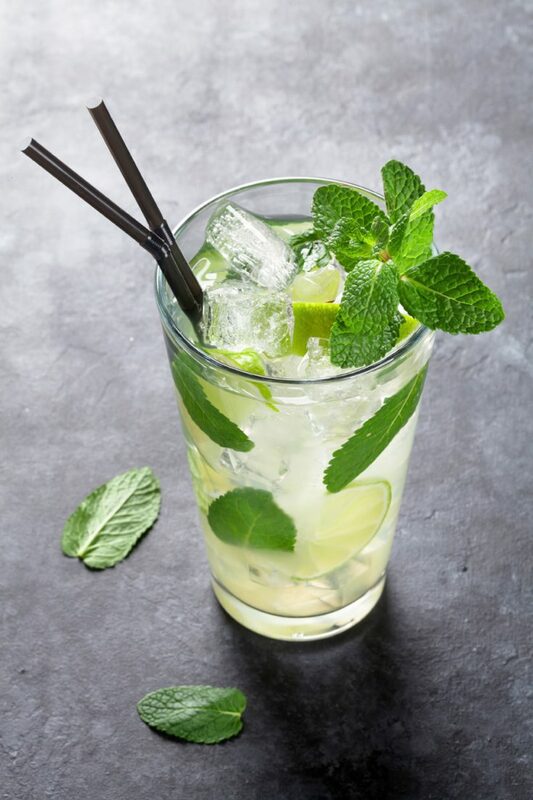 The Mojito (pronounced: moe-hee-toe) is a classic Cuban cocktail most closely tied to Cuba’s famous La Bodeguita del Medio bar. This drink is incredibly refreshing and is a great cocktail to order on a hot summer day or when hitting the dance floor. The basic drink is remotely similar to a limeade recipe, but that’s where the comparisons stop. The first noticeable addition, after rum, is mint which provides a refreshing cooling sensation to the drink. Mint is what makes this highball an exceptionally refreshing drink. Next, the rum gives the drink a kick and balances out the blandness of soda water. The limes provide the thirst quenching sourness that so many people crave in the heat. If possible, use key limes (Mexican limes) for this drink as they offer a crisp flavour. A good white rum, like Havana Club (3-Year-Old), will give the Mojito a more authentic character, but any quality white rum will do. Did you know that most white rums are aged for one year? Using simple syrup will help make your Mojito’s better since granular sugar doesn’t dissolve too well in cold liquids. Gritty Mojito’s aren’t very appetizing. 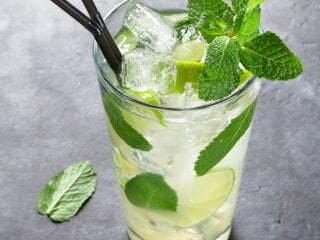 When preparing your Mojito, gently muddle the mint leaves with the simple syrup and lime juice. You don’t want shredded leaves floating around in the drink. It doesn’t make for good presentation, and you are having a cocktail not drinking a salad. Simply bruise the leaves with the muddler to release the essential oils. After muddling, pack lots of ice over the mint leaves to keep them from floating around. You want to fill the glass with ice. Otherwise, the soda water will dilute the flavours too much Add your rum and then top off with a splash of soda water, and it shouldn’t be more than a few ounces. 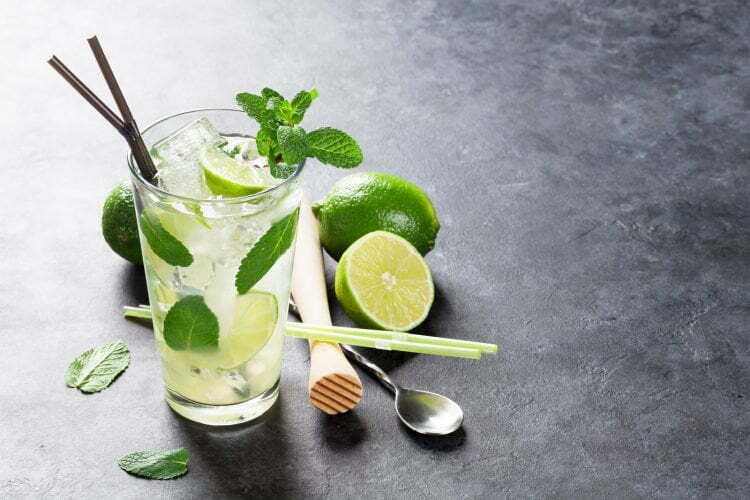 Some recipes call for bitters, but a Mojito does not contain bitters. (*Or at least that is what I was told by some Cuban bar customers in 2008, however, when I was in Cuba (2016) some bartenders did add bitters, some didn’t. Do whatever you think tastes better.) I was also informed that I needed to dribble some rum from every new bottle of rum opened into a corner of the bar or house to keep the spirits happy. I like traditions, so I obliged. The classic Cuban cocktail that is always refreshing. Rolling (passing the muddled mixture with the ice back and forth between the glass and shaker tin) a couple of times helps to mix the Mojito properly. If you just leave the rum, simple syrup and mint on the bottom of the glass it will not mix properly and the bottom of the drink will be sweet and strong, the top just soda water. Since the Mojito has gained more popularity in the last decade, people have been creating unique and tasty variations. To keep this drink interesting, try adding Perrier or other sparkling mineral waters, lime flavoured Perrier or a touch of champagne in place of the club soda. You can also add berry purees, such as raspberry or mango, but once you do that you are moving away from the refreshing qualities of a Mojito and those just become rum long drinks. Check out the Centaur, which is a cognac and ginger ale cocktail based on the Mojito. Looking for something non-alcoholic? Try a Lemon Soda.